Ethiopian Airlines, the largest Aviation Group in Africa and SKYTRAX Certified Four Star Global Airline, has won the 2018 ‘Africa’s Outstanding Food Services by a Carrier’ Award. ET, as it is popularly known and called was voted by PAX International readers at a ceremony held at the Radisson Blu Hotel in Hamburg, Germany in April 2018. Speaking, Ethiopian Group CEO, Mr. Tewolde GebreMariam, remarked, “It is very gratifying to receive this prestigious award, which is based on the vote of the traveling public. We are highly honoured that the traveling public has recognized our continuous effort to avail the best possible products and services. He continued, “As part of our Vision 2025, we have built the largest and most modern catering facility in the continent at our main hub in Addis Ababa with a daily production capacity of 100,000 meals. This has enabled us to significantly upgrade the capacity, the quality and the variety of our meal production. Our modern catering facility produces a variety of cuisines that can meet the need of our esteemed customers ranging from our national Ethiopian dishes to Chinese, Indian and Italian culinary delights. It also caters for specific dietary needs with vegan, Halal and Kosher meals. 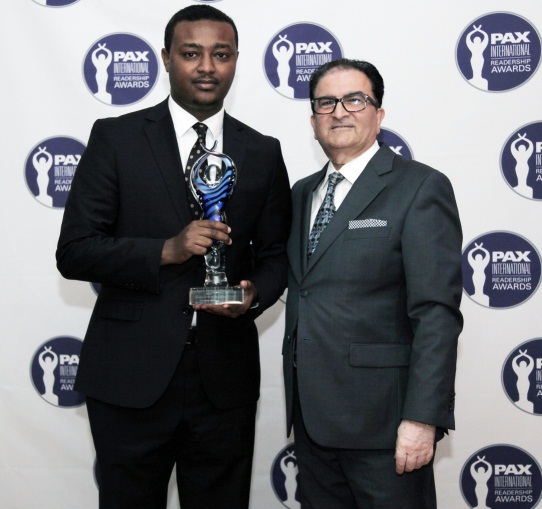 According to Ethiopian Airlines winners of the awards were selected by PAX International readers over a period of six months. “From airline caterers and airport lounges, to amenity kits and duty-free programmes, to IFE and seating, the PAX Awards is a barometer of where executives in the onboard services and aircraft interiors industries have found their attention over the course of the previous year. We were overwhelmed with the response to this year’s event. The PAX International team and I would like to thank the industry at large for their continued support of our publication and these awards and would like to once again extend our congratulations to the 2018 winners. We look forward to an even larger celebration when we return to Hamburg in 2019,” he said. Be the first to comment on "Ethiopian Airlines Wins 2018 Outstanding Food Services Award"